Looking for special packaging design to promote your brand but are on a tight budget, need it yesterday or cannot afford large quantities? Grauman Packaging can help! For 30 years we keep our clients coming back to us for trendy brand packaging that is available from stock and that can be imprinted with your logo in small quantities. 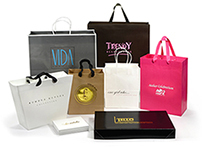 Almost all of our stock bags, boxes, garment bags can be hot stamped or silk-screened with your logo - it is an affordable option when custom packaging minimum order quantities are too large for your business or you need a quick solution until your custom order arrives. We do all our hot stamping in house which ensures quick turn-around time, precision & high quality. We are experts at this craft and can even hot-stamp your logo in two colours, provided that the colours don’t touch or overlap. There are many foil colours to choose from but if you need an exact Pantone colour match, print fine lines and details, silk-screening is the preferred print method. 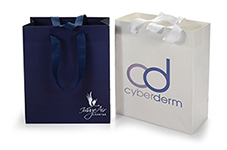 Enhance your image by adding branded packaging accessories, such as custom printed tissue, branded ribbon, branded labels and make your package complete. Need help with artwork? We offer in-house graphic services to help you get the job right! You don’t ever have to settle for dull packaging again! Our professional, experienced sales staff is ready to help you determine the best options. Call us now at 416-739-1818 or 1-877-723-5701 for more information or to set up an appointment at our showroom with one of our brand packaging experts.